He was the beloved companion of my dear friend, Judy. 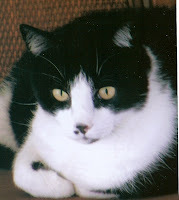 A terribly handsome black and white cat, Smudge spent many years in Judy’s happy furry family. He always wanted to be nearby, but not held or cuddled. About 18 months ago he was diagnosed with a very serious heart problem, but he continued to live as if nothing had changed. It is one of the wonderful lessons our animal companions teach us – live for today, and we’ll worry about tomorrow…well, tomorrow! He continued to be a light in Judy’s life, enjoying the new kitty furniture she had bought and being the first one to show up for Catnip Friday – the day everything gets a sprinkle of fresh catnip! Things began to change a few weeks ago, and it quickly became clear that Smudge’s extraordinary heart would not beat forever. Judy and her veterinarian tried everything they could think of to help him. Smudge tried, too…until he let Judy know his soaring spirit wanted to be free of his old, worn-out body. Judy said goodbye to her dear Smudger on July 23rd. Catnip Friday is forever changed, as that special ritual has little meaning for Judy’s other kitty, Cinnamin, and absolutely NO meaning for Jeremy…her English Bulldog. Smudge is happy and healthy again, flying through the stars with furry friends from days gone by. He is watching over Judy and the boys… but he is missed more than any of us will ever know.